Market 707 at Dundas and Bathurst is instantly visible for the yellow facade of its vendor's stalls. The various businesses operate out of insulated shipping containers outfitted with fridges, hot plates and whatever else each business requires. The small food court has been known by many names, and was often referred to simply as the Scadding Court Marketplace out of convenience and for its affiliation with the Scadding Court Community Centre. While the old court was more officially dubbed the Live Local Marketplace, the newer vendors have moved away from that mandate, and more into representing the international flavours of their home countries. There's now a waiting list for future vendors, rapidly transforming Market 707 a hot piece of culinary real estate. 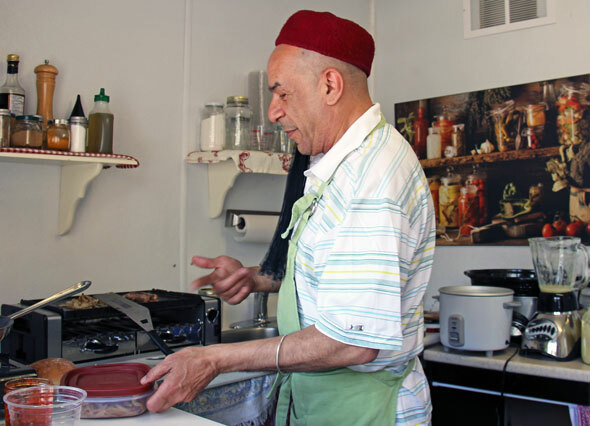 Casbah has been in Market 707 for three months and behind the street-side window, you'll find owner Dali Chehimi preparing North African dishes with a significant slant towards trends in Toronto restaurant cuisine. You'll find camel sliders($8/3)--that's right, camel meat--a "lamburger" with moroccan spiced lamb and smoked paprika mayo ($7), and handmade halal lamb sausages paired with caramelized onions on a baguette ($6). Chehimi has even streamlined the take-out process--text him at 416.258.4195 before you're bound to arrive and he'll prepare your order. Don't leave without a side of his homemade fresh mint lemonade ($3). T&T Roti is another new vendor which offers Caribbean cuisine such as vegetarian ($5), shrimp ($8) and chicken roti ($7). You'll also find vegetarian, curry goat and jerk chicken meals on a jasmine rice base ($6-$8) and homemade drinks with sorrel and mauby for $2. 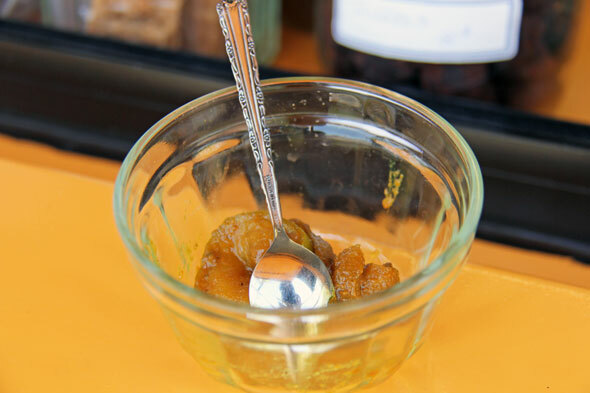 Most options feature a balanced blend of curry and apple chutney, and everything is handmade with all-natural ingredients in owner Marilyn's small kitchen. The affordable prices are meant to promote accessibility in the neighbourhood--she previously taught cooking and sewing at Ryerson for single mothers, and has brought that same community-minded approach to Market 707. "It's not about the money," Marilyn tells me. "It's about giving back." 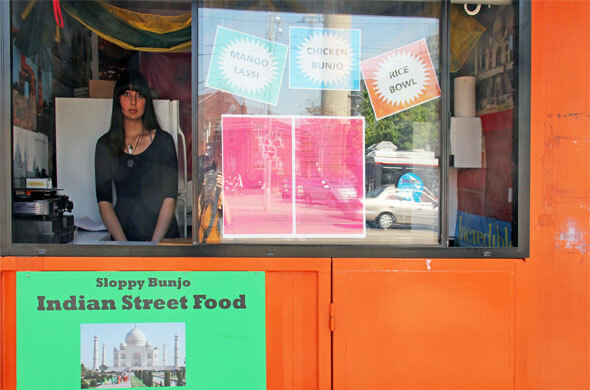 Sloppy Bunjo is a veteran of the court, and serves up Indian street food courtesy of Magic Oven's Tony Sabherwhal. There are a variety of health-conscious and vegan dishes such as vegetarian samosas ($2.50), and rice bowls with butter chicken ($6.50), chana masala ($5) and vegan istoo ($6), which is a blend of lentils and sweet potatoes. They also offer their namesake dish ($3.50-$5)--an Indian-inspired version of a sloppy joe blending yellow masala peas in tamarind and an assortment of spices, which is also available with tandoori chicken or samosa. Try it with their mango lassi or raspberry lemonade. 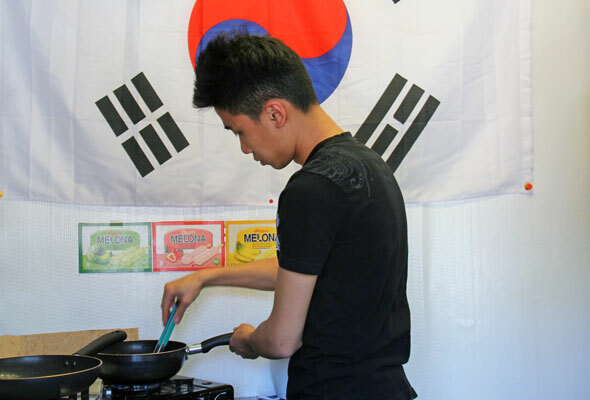 Kim's a la Cart has been in Market 707 since last year, and is the third location of the family-owned and operated Korean street food stand. This location is manned by the son of the family, and offers a similar selection of dumplings ($1.25/2), rice and seafood cakes, and noodle soups ($3.50-$4.50) to the other locations, with one glaring omission: the red bean waffle cake that so won my heart at 214 Augusta. 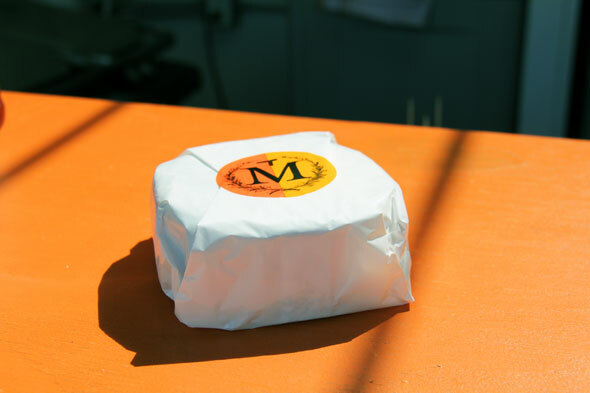 Monforte Dairy Co. has had a stall in the marketplace since the beginning. At Market 707, they're offering simple grilled cheese sandwiches ($5) made with their own butter and cheese, and served piping hot from one of their two hot presses, and are planning water buffalo ice cream in the next few months. After sampling a small cube, I can't resist picking up a wedge of earthy clothbound aged cheddar. The Original One has been serving bubble tea out of Market 707 for a while now, but has recently added dim sum to their menu. For $3, you can choose from an assortment such as tea and egg, steamed cream bun, or traditional shin-mai. 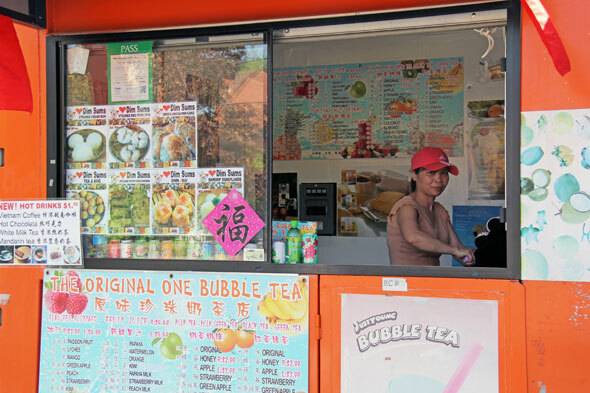 Their bubble tea is offered in traditional tea and milk tea form, as well as in fruit juice or as a blizzard--$3.99 for regular, and $4.99 for large in an array of flavours ranging from passion fruit to taro. 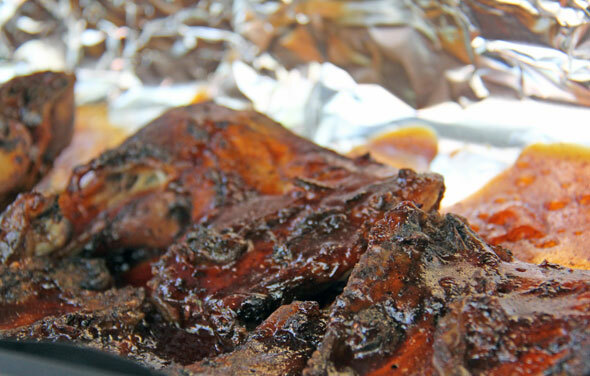 Kanto is the street food outpost of Tita Flips' popular catering company. Run by Diona Joyce, the modest stall churns out pork and chicken spring rolls, tosilog (a blend of Filipino cured meat, garlic fried rice and a fried egg) and palabok (noodles topped with shrimp, pork cracklings, fried garlic and boiled egg slices). 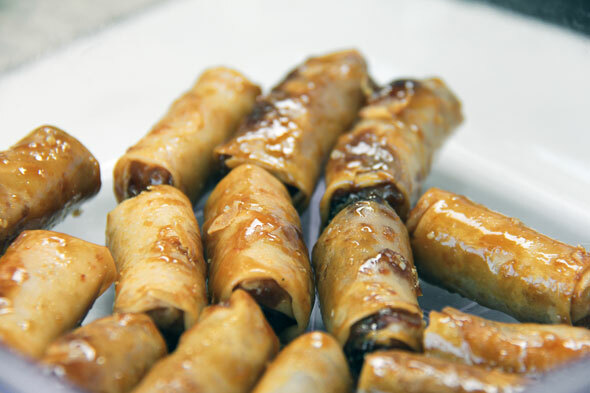 Particularly delicious is the turon, a crispy mix of plantains and raw sugar in a deep fried wrapper ($2/6). House of Jaffle is the product of a mid-life crisis. Owner Marc Perreault decided to leave the world of corporate hospitality behind in lieu of opening his own shop inspired by that Parisian staple: the crepe. 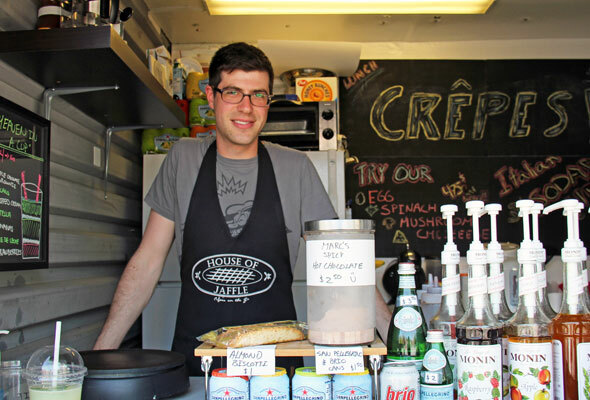 You'll find savoury options such as the prosciutto (prosciutto, fig jam and brie for $6.50), the crepe dog (a hot dog wrapped in bacon, then wrapped in crepe for $4) and sweet staples such as nutella ($3) or apple pie filling, walnut and cinnamon ($4). He's also planning ice cream crepes for the summer. Spin Can is the one of the odd-men-out in Market 707, and among its newer vendors. 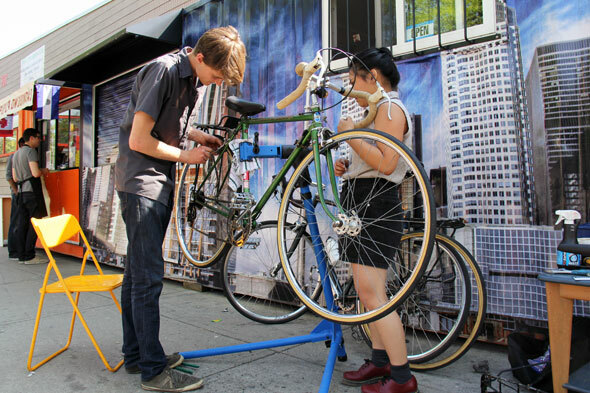 The bike repair shop is run by Satchel Dille-Boyd, who previously worked at Sweet Pete's. He also sells second-hand donations, and offers reasonable prices on his services--you can expect $35 for a standard tune-up. Manned by Flora, La Pupusa is the resident vendor of Salvadoran flavours. The eponymous dish is served on a thick, corn flour tortilla, and is available with its traditional filling of cheese, shredded pork, and beans, or simply with cheese or cheese and beans ($2.50). You'll also find burritos ($4.50), tacos and lunch specials. Best of all, pupusas are naturally gluten-free. 1LoveT.O. 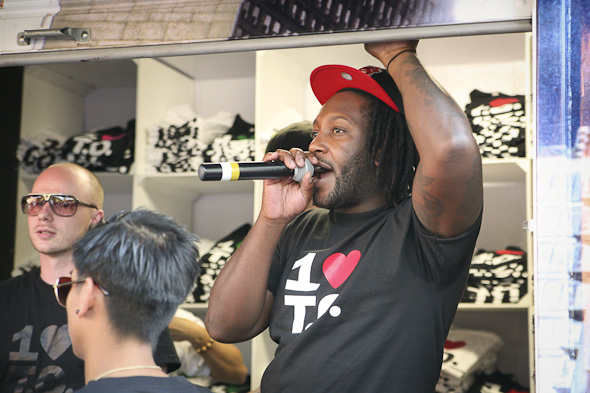 is a Toronto-centric website promoting local Toronto artists--particularly musicians and fashion designers--and community issues. At their Market 707 outpost, you'll also find their proprietary brand of T-shirts and buttons. 1LoveT.O. has the marketplace's most irregular hours and is typically open only Friday-Sunday. Over the next few months, Scadding Community Centre is planning a Night Market Events series, with the next instalment taking place on Friday June 15 between 6-10 p.m. With minor variations, all of the stands are open Monday to Saturday, between 11 a.m. and 7 p.m.